Fresh or dry. 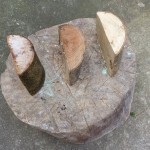 When is firewood easiest to split? I always considered that immediately after it was harvested was the time to split wood. This is for the simple reason that splitting the timber opens up the pores and allows the timber to start drying quickly. Waiting for the timber to dry first before cutting will take the seasoning process longer. But when is it easiest to split firewood? When is it easiest to chop wood? The honest answer is I am not sure, because I have usually always chopped my firewood as soon as I obtained it (or bought it pre-chopped). But I have tried chopping large wet, green timber and found it hard going at times. If I allowed it to dry out it might have been easier. When timber is seasoned properly and dried, shrinkage cracks open up. These presumably would make the timber in question easier to chop? Simple experiment. To try and help answer the question, I tried a quick experiment. I lined up three beech logs of similar size. See photograph below. One was frozen, LHS, (I put it in the freezer for 3 days! ), one was dry, RHS, and finally one was wet, centre. I tested how much force it took to chop the various logs by dropping a maul from various heights onto each log. Paul Carroll of The Fuel Depot in Allenwood, County Kildare. Paul supplies seasoned firewood and turf to Kildare and Dublin. He thought that it was more difficult to chop dried wood than fresh green wood. However he said that many woodmen still leave harvested timber uncut to season for a year, as it is harder to store when chopped. Presumably as they use machines to chop the timber any increased difficulty in chopping dry wood is of less concern. Gerd Benndorf, County Kildare. A fellow engineer and good friend, Gerd, harvests his own firewood and chops it by hand. He said that in his experience conifers split easier when seasoned, but that wood from deciduous trees splits easier when green. He also said that he noticed that wood was easier to chop if the log was positioned for chopping in the same orientation as when the tree was growing. Anyone else have their experience to share? I want one. Those clever Finns. I’m afraid there is as more in technique to chopping wood than there is might. My 80 year old grandmother could effortlessly chop a log into little pieces with an axe whereas no matter how much force I try at chopping the same log to no avail. Apparently, log chopping is something one has to learn to acquire the skill much like riding a bike. I’ll leave it to the experts. But to this day I’m still baffled at how peopl can chop a 1 foot log in one swing of an axe whereas I only get the axe stuck on it about an inch in. I have recently cut a big ash bough. I tried to split it immediately and found the axe difficult to embed in the wood. The blow seemed to rebound a bit as if the wood was rubbery. I did succeed though. After 10 days in good summer conditions, I returned to the job and noticed some star shaped shrinkage cracks. I found it easier to embed the axe in the wood, the hard rubbery effect was gone. Burning and splitting wood is always difficult me because of drying issue. Thanks to the author for clarifying.